Iceality means; "We are All Connected"
ARK in Berea - This Pragmatic Peace Paradigm from the International Center for Environmental Arts addresses areas where Peace Agencies working together may be able to achieve greater efficiency and effectiveness in the real sense across boundaries, cultures, societies and nations to build the new sustainable Culture of Peace Movement for All Living Things (ICEALITY). Within these areas are growing zones of fragmentation, overlap, or duplication where multiple agencies and activities are creating waste and inefficiencies. Although at times, it may be appropriate for multiple agencies or entities to be involved in the same programmatic or policy area due to the nature or magnitude of the Peace effort, there are many areas where opportunities exist to achieve resource savings and achieve financial benefits. To address the issues identified in this report, Ambassador Renate says, being more realistic, will lead to better results. “If we would pick just one or two things, we can cut out a lot of the clutter and divided attention and actually experience a little transcendence and success, which is really what, according to the Iceality Methodology, drives humans to repeat good behavior over all,” she says. The world is full of confused and distressed individuals who will follow their own greed recklessly at the expense of others. They have been plentiful and active enough to manipulate history, and their history has proven to be a valid warning guide for future actions. Hence, new activists can learn from the past to be forewarned of what the future may hold for them if ambiguous people are allowed to operate out of control and unopposed in the proposed peace movement. A little sweat in this area now may save a lot of blood later and prevent the Culture of Peace Movement heading into Chaos. Given that these areas of concern extend across the globe and, therefore, in a wide range of conditions amongst these areas, it would suggest that a similarly wide range of actions be open for consideration, preferably without compromise. 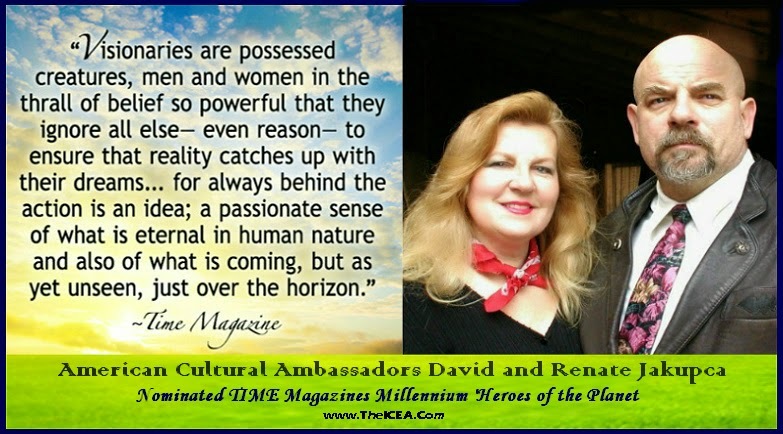 As ICEA CEO and American Cultural Ambassadors, David Jakupca has stated previously, “To support a new Universal Culture of Peace Movement that’s built to last, we need a Sustainable Iceality System built for the 21st Century. 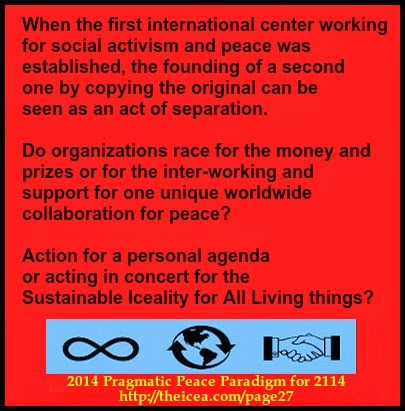 We’ve made real progress toward that end at ICEA, and we look forward to working with others to enact reforms to make the Culture of Peace Movement work more effectively and efficiently amongst all living things. two or three times. Over the past thirteen years, ICEA’s accountability research has found many areas where Peace Agencies are now duplicating efforts, at a cost that can be escalating into billions of dollars. How many billions? No one knows. "The big problem the ICEA has is that we can't adequately estimate their savings because Peace Agencies won’t tell them how much they're spending," said David Jakupca. “From day one, ICEA has made rooting out waste and improving the way it works a top priority," said in a statement from Patrick Cahill, controller for ICEA." Often, several Peace Agencies are doing the exact same research but with different sponsors. 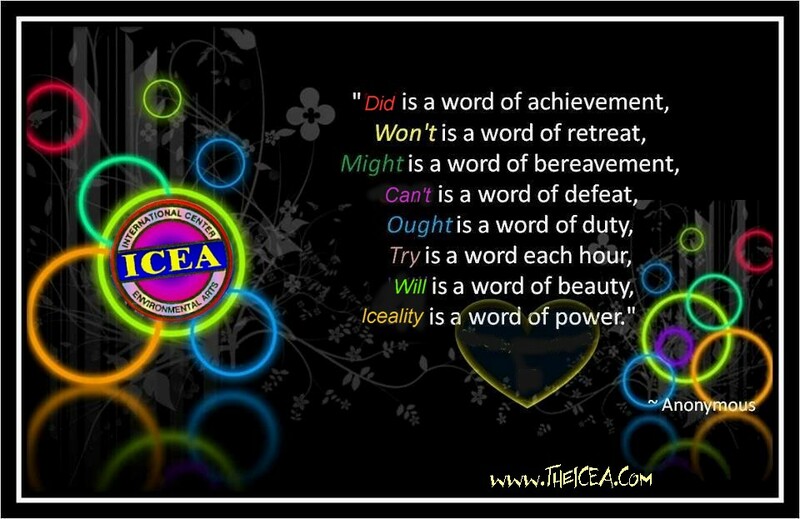 ICEA found Peace Agencies that partly or completely overlapped their work being done by other Peace Agencies. A good portion of this replicated work is unintentional and with good intentions, but as the Culture of Peace Movement grows and becomes more lucrative, it is attracting charlatans masquerading as legitimate organizations. Already, grants from different sources are awarded to the same unscrupulous researchers, allowing them to "double dip." "The point is, the Peace Agencies will not exchange information about their programs because other Peace Agencies will ‘poach’ their information and use it as their own. It is inherent in the design, that a Top Secret Military Complex must shield its research from Spies when creating new weapons of War. However, Iceality Agencies should be transparent and open but credit needs to be given for the research on creating new tools of Peace that they develop. Except for the United Nations, which has limited authority, there’s no centralized place where all this valuable stuff could be discovered, searched, managed and protected." Jakupca said. "Another point is that these Peace Agencies, of course, have different missions, and they're somewhat competitive for funding. Some benefactors like to see that their money goes First to the best people that will support and advance their own special interests than to the people they claim to represent Second.’ he said. "Competition is good, but cooperation is also good." People are going to go slow when addressing this problem, but that's because there is no reliable information as much as bureaucratic resistance. 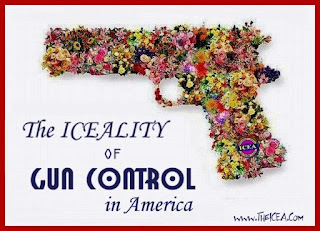 "The People have the ultimate authority. The People created all these Iceality Programs. The People ought to oversight them, downsize them, put limits on them and then fund them properly, and then come back in about two years and see if they're effective," Jakupca said. "It's complicated since all peace programs are joined at the hip someplace with International Political Parties usually with a narrow-minded benefactor, and career politicians that don't want to irritate their patrons." 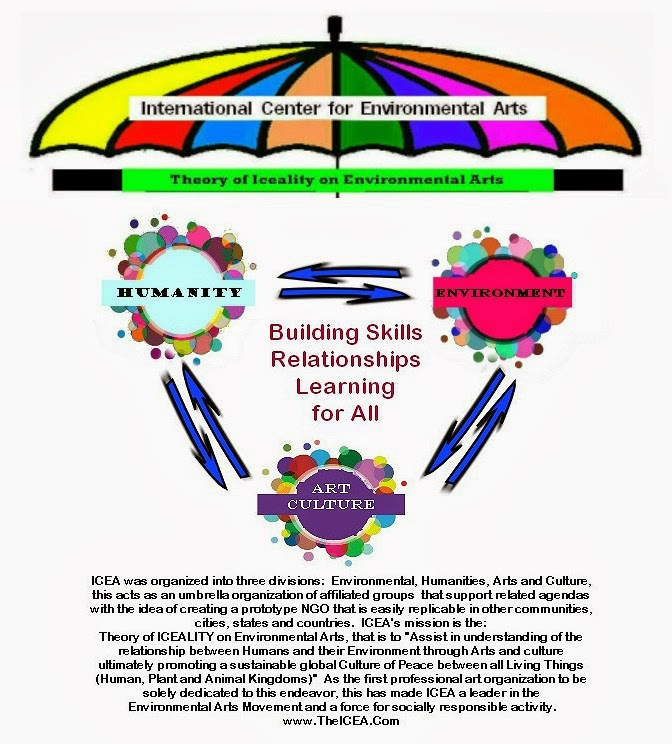 THEORY OF ICEALITY ON ENVIRONMENTAL ARTS is the practical study on the aesthetics of the relationship between Humans and their Environment through Arts and Culture, ultimately promoting an effective sustainable global Culture of Peace between all Living Things ~ Human, Plant and Animal Kingdoms! What is a dream? What is a dream of Peace for the Worlds Children? That is a dream. Get yourself a dream and never, ever let your dream get away. 2013 was all about this: trying new unexplored area’s of Peacekeeping I never was able to do before. The starting point of great dreams and achievement has always been the same for me. It is for you to dream BIG dreams. There is nothing more important, and nothing more exhilarating than for you to cast off your own limitations than for you to begin dreaming and fantasizing about the wonderful things that you can become, have, and do. That feeling makes you want to realize your biggest dreams, feeling independent, feeling powerful at first, then astonishing fragile as a lamb and back again as a lioness. 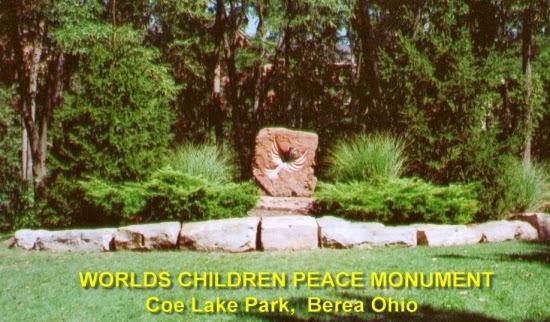 2013 was for me the year of the new collaborations with some of my favorite Causes: from the role as Cleveland Ethical Fashionista for ICEA (for which I’ve been reconfirmed for 2014) to Universal Peace Ambassador for the Worlds Children Peace Monument (WCPM). This year I am looking forward to working with Muhammad Atta Ur Rehman and The Multipurpose Inter Parliamentary Union – TMIPU, Mr. David Wright Of Global International, Mr. Elvis Bogonko, Executive Director at Jambo Charity Organization and Deans Triplett of Deans Images to name a few. New Peace Stones are already delivered to Nikki French for Ashtabula and Sean Brennan for Parma. 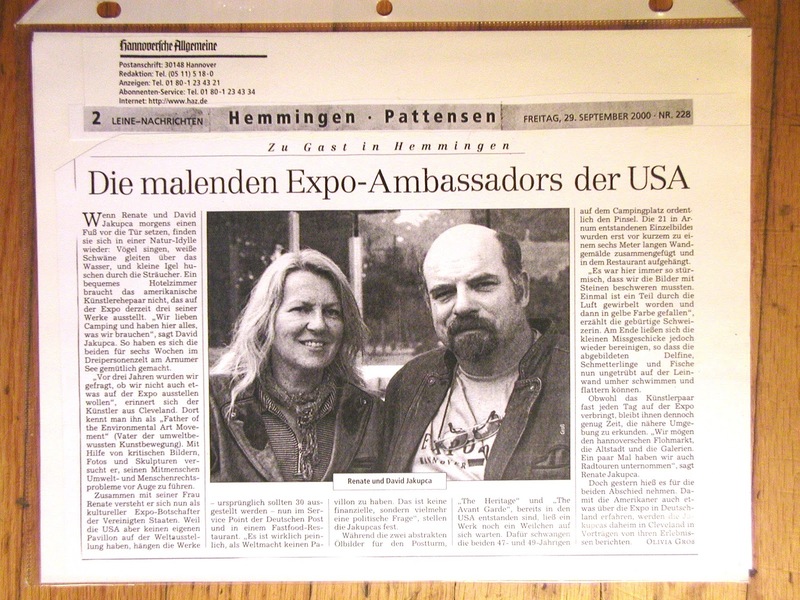 Sarajevo in Europe and Lisa Parker Co-Founder and Coordinator, Peace Day Philly have made inquiries for 2014 deliveries. 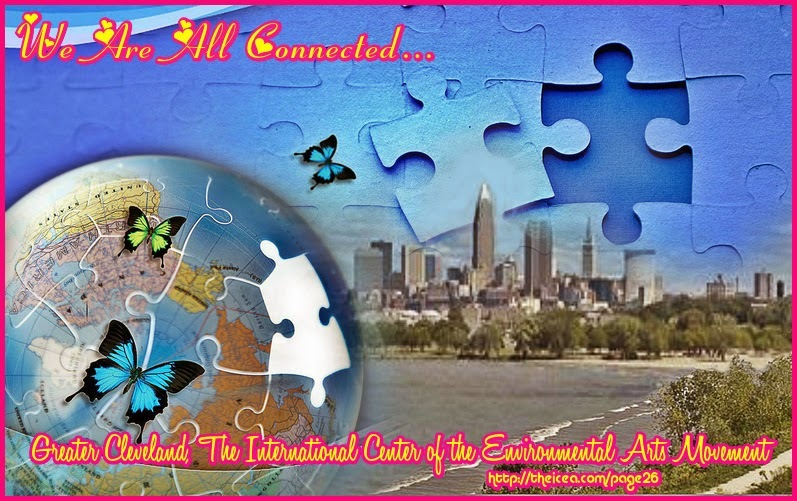 And with ICEA's help and assistance, Cleveland may become an Official International City of Peace in 2014!! This 2013 was a magic tragic year, full of joys and satisfactions but also of difficult moments, where I wanted/could/had to only count on myself. And you know something beautiful about it? You can do it. You suffer a bit, but then you wake up stronger than the day before. 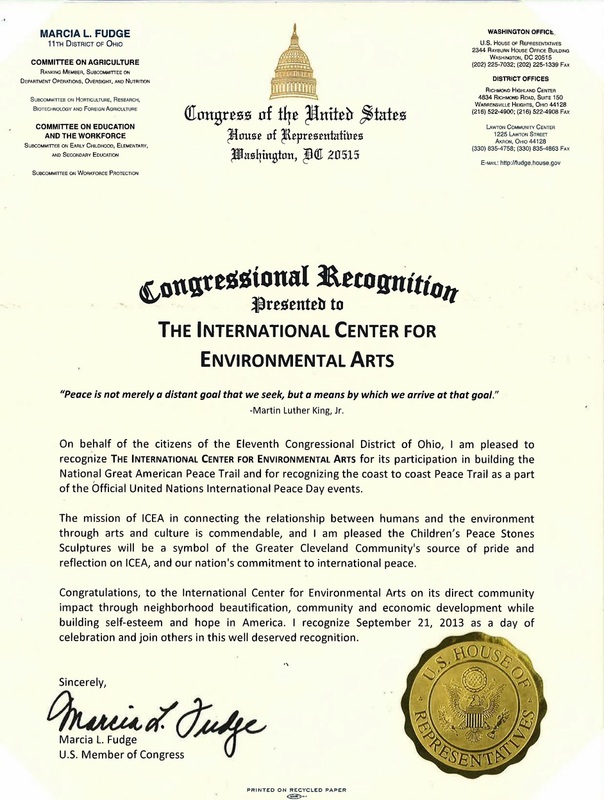 But 2013 was also the year of Rewards: ICEA received a prestigious award from the Canadians for the First International stone of the Worlds Children Peace Monument erected in Windsor to mark the occasion of the 2013 International Children’s Games from Canadian Organizations. 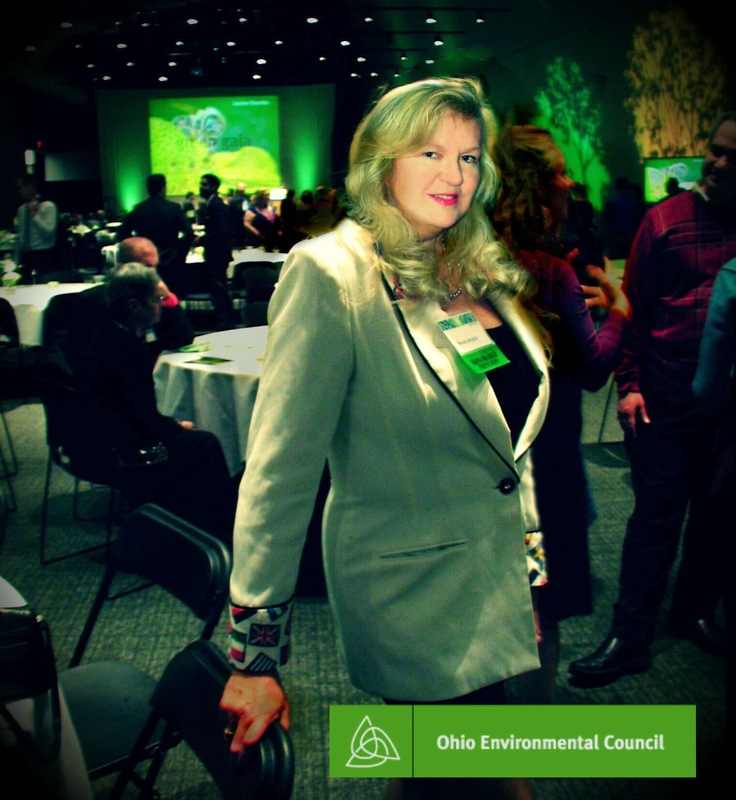 David and I were honored at the Ohio Environmental Council’s 2013 Green Gala in Columbus, Ohio primarily for our part of the historic re-unification of the Greater Cleveland Community under the Iceality Silver Revelation. 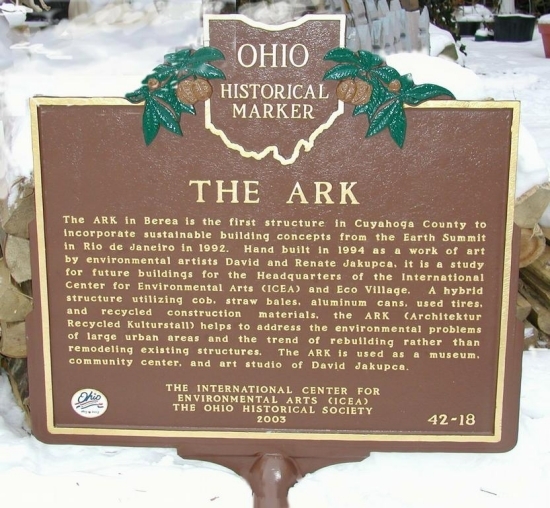 North East Ohio Area has been 'branded' as the Home of the Environmental Art(s) Movement by the International Center for Environmental Arts (ICEA) as a 'Cultural Industry', to foster civic identity, cultivate jobs and tourism, and brand Ohio Environmental Arts and Culture District in the Bioregion. We also received an award from AARP for recognizing our work with our peace project as Community Heroes. 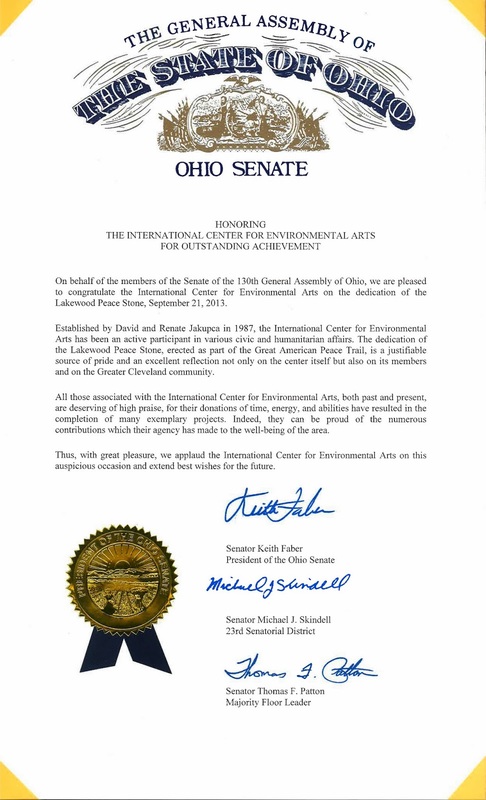 Among other recognitions are a Proclamation from Senator Michael Skindell and a Congressional Proclamation from Congresswoman Marsha Fudge dedicating the Lakewood peace stone as part of the building the National Coast-to-Coast 'Great American Peace Trail' and the Worlds Children Peace Monument (WCPM). 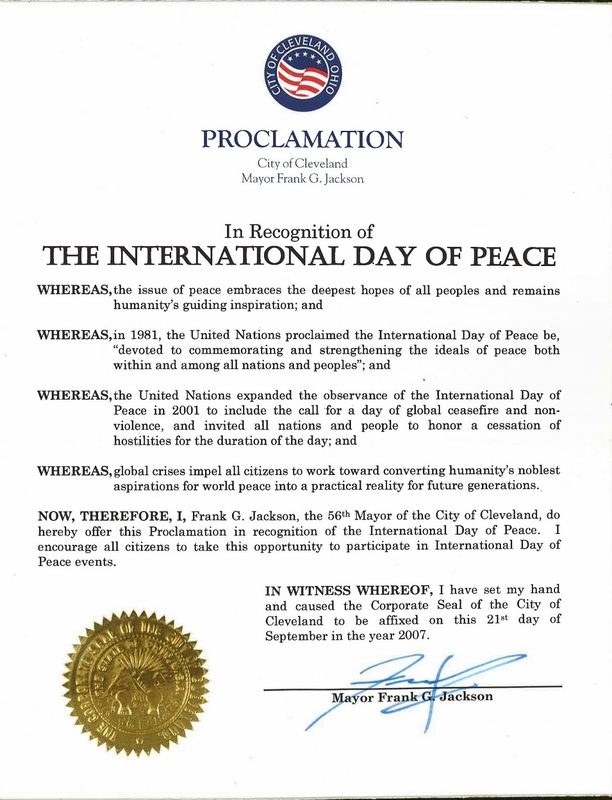 This was an Official event of the 2013 Cleveland International Peace Day Activities. We also presented two awards to the Cleveland Männerchor celebrating their 140th Anniversary. I presented an award on behalf of Cleveland Councilman Kevin Kelley on behalf of the City of Cleveland. 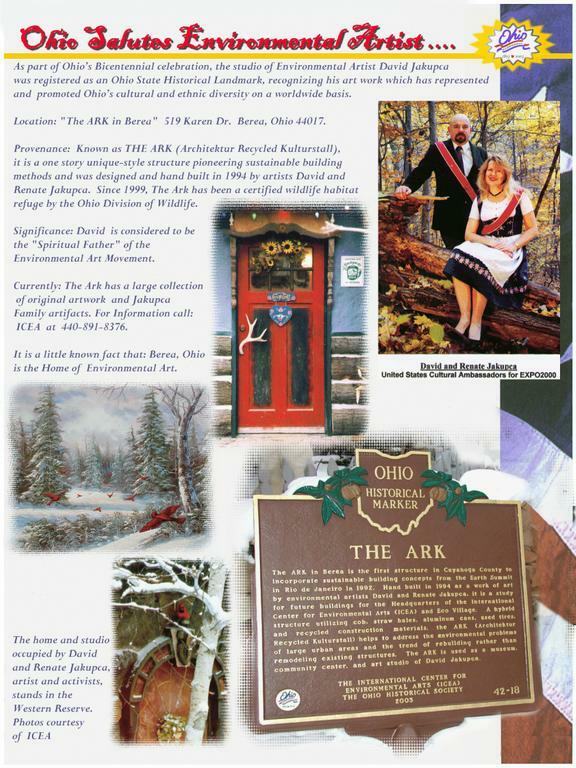 At the same time a plaque was presented from the Ohio German American Business Association to Bill Trivison, President of the Cleveland Männerchor. My social media network grew like crazy in this year expanding to reach all four corners of the globe. A bit of thanks to social media, which helped me become better internationally known, a bit for my role of active blogger and influencer, and a lot of people who didn’t understand what we were doing started to respect me and replicate me. I also understood myself that my Ambassador job is a difficult to describe, but that I can use it to share a positive messages just by being myself. Never before have I felt freer to express myself and speak my mind. 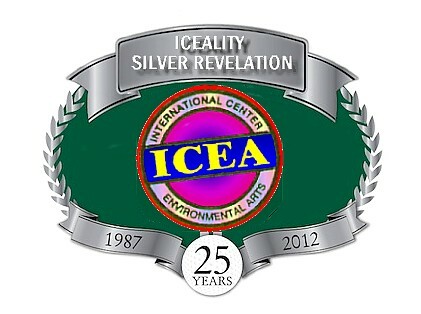 Not everyone will like me, but I’ve never been so happy of all the success I had by opening ICEA 26 years ago. All this would have never been possible without my support group: It grew with Ken, Jane, Monica, Paul, Ruth, Douglas and Michael as new members all of which composed by experienced dedicated people. 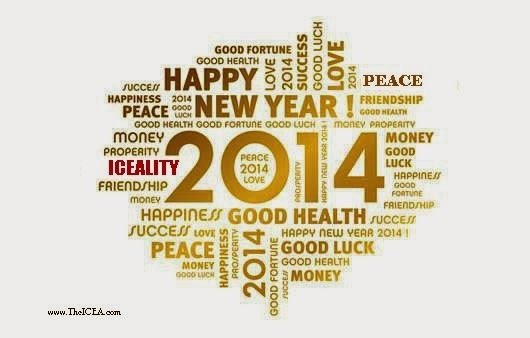 I don’t know where I’ll be in 2014, what I’ll do or what I’ll be feeling in a year: global peace seems possible yet mysterious. Changes don’t scare me anymore, they excite me. I still get happy as a kid for new projects and surprises, and this makes me proud. I try not to set boundaries, but I also accept the tears and the times I lose, which make my success even more important. I have a lot to learn yet and I want to grow and see the best of me, but in my wish list for next year, there is a wish which is the most important to me: never stop exploring. Exploring places, exploring people, exploring feelings and explore myself. I want to discover all the magic of Peace around me. And yes, you all are a part of it: you’re the spell that made most of my dreams of Peace and goodwill for all living things a reality. Thanks for this 2013. At the end of the year I ask myself, if this was my last year on earth, would I be happy with it? My answer is yes. And really, that is all that I can ask for.